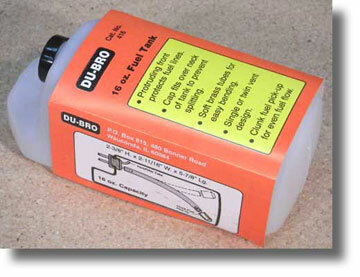 Du-Bro makes the best fuel tanks in the business, and this 16-ouncer is recommended for the Venture 60, Flyin' King, and Delta Vortex. In fact, you will see it drawn on the plans for all three kits. 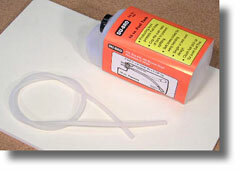 BTE adds value to the package with a couple feet of large fuel line and some foam rubber. There is probably enough foam included to wrap not only the tank, but your receiver and battery as well. 24" Large Fuel Line .093 i.d. Tank is shown here with the fuel line and the foam padding.